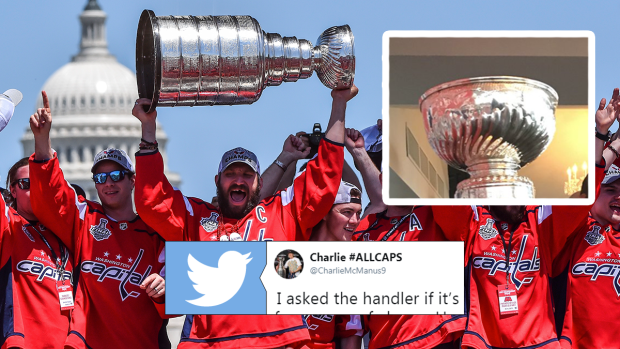 The Stanley Cup is one of the most worshipped trophies in all of sports, but that doesn’t mean it’s treated with the utmost care. It’s not a bad thing either, hockey players letting loose when they achieve their life goals is one of our favourite parts of the sport and it’s not as if it can’t be fixed. There are countless examples of the Stanley Cup being damaged dating back to 1907 when the Ottawa Silver Seven punted it into the Rideau Canal and left it there overnight. From the Capitals partying, the cup seems to have a lean. As we said, this will likely be fixed by next season. It looks like it is similar damage to what the Penguins did in 2016 that could be seen when Kris Letang was carrying it onto a plane. It’s pretty clear that on the base there is a massive dent. Luckily for the Penguins and Captials, it seemed like they only dented the base – in 2011, Michael Ryder basically turned the top of the cup into an oval.